Tom Hollander Plays Two Brothers in Breathe. In Andy Serkis’ Breathe, Tom Hollander is tasked with the extraordinary job of playing the twin brothers––Bloggs and David––of Diana Cavendish. As Diana (Claire Foy) faces the daunting challenge of caring for her husband Robin (Andrew Garfield) after he is struck down by polio, her brothers become her counselors and sounding board for the difficult decisions before her. Having worked with Hollander both on stage and in his upcoming film The Jungle Book, Serkis knew that Hollander had the requisite talent to play both twins and make each unique in his own way. Playing against himself “required extraordinary technique from Tom, who really is a virtuoso actor,” notes Serkis. “Tom would play one of the twins in profile, and he always had a stand-in to act against. Then we’d come round the other side of him and shoot the ‘other’ brother.” This cinematic pas de deux puts Hollander in a special club of actors who’ve created movie magic by playing against themselves to create the illusion of identical twins. 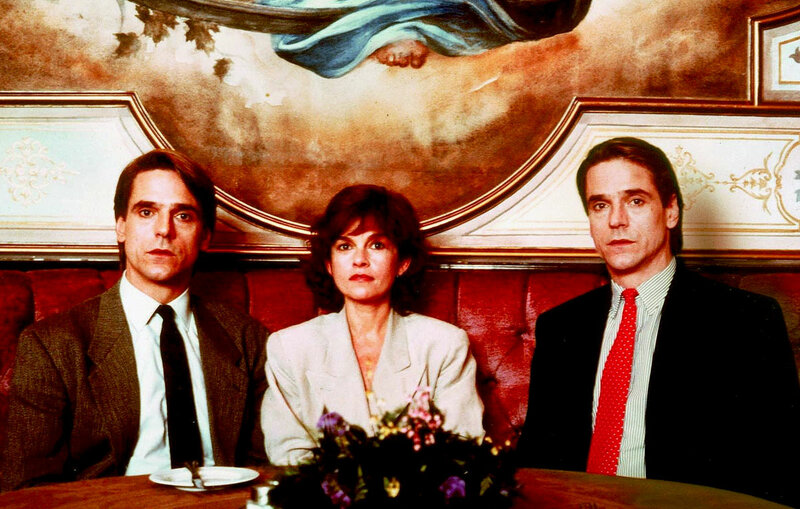 In David Cronenberg’s medical thriller Dead Ringers, Jeremy Irons plays Elliot and Beverly Mantle, identical twins who are partners in a gynecological clinic. The story was adapted from Bari Wood’s Twins, a novel inspired by real-life twin gynecologists Stewart and Cyril Marcus, whose lives spiraled out of control, ending tragically in 1975. Cronenberg turned this bizarre tale into an icy cinematic exploration of paranoia and perversion. In their twisted relationship, Elliot, the more aggressive brother, first seduces the clinic’s clients, then cruelly allows his female victims to mistake his introverted brother, Beverly, for him. But when Beverly falls in love, the relationship between the two spins out of control as they lose sense of what connects them––and what makes them different. While Cronenberg used special framing devices to create the illusion of Irons being a twin, the actor had to find his own way into how to make each character distinct and recognizable. Originally using separate wardrobes and dressing rooms for each brother, Irons ultimately jettisoned these props for a more direct approach. As he explained at a Cronenberg retrospective at the Toronto Film Festival, “I found an energy thing inside,” imagining the essence of each twin as radiating from different parts of his body. This technique proved more than convincing. “Irons, who uses few conversational clues to establish which twin he is playing in any given shot, manages to make this conflict as dramatically sharp as it is psychologically riveting,” notes The New York Times. 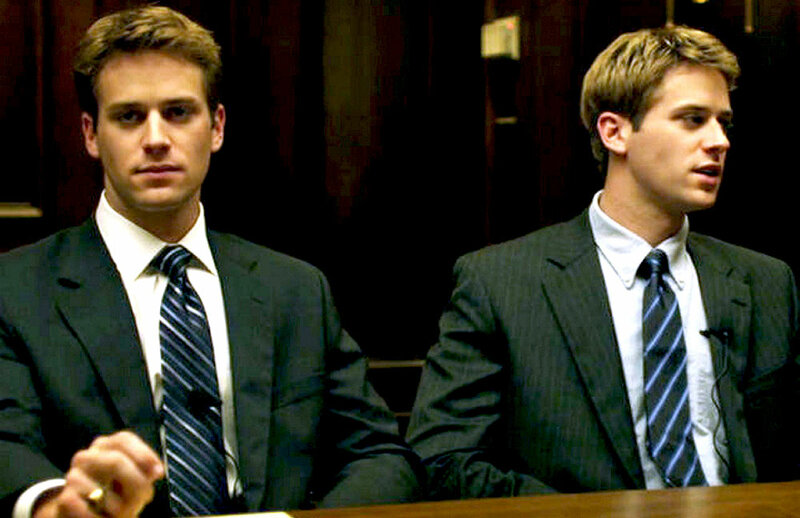 In making The Social Network, David Fincher needed to convincingly portray Cameron and Tyler Winklevoss, the Harvard twins who sued Mark Zuckerberg (Jesse Eisenberg) for allegedly stealing their web concept. 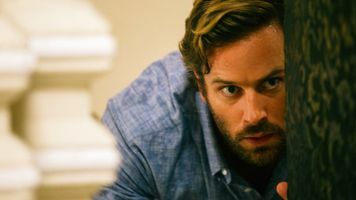 The two actors—Armie Hammer and Josh Pence—who were cast to play the parts were in the dark until the last moment about how the illusion of twins was going to be created. 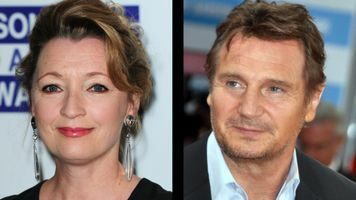 Fincher had both actors swap roles and clothes in various scenes before fully demonstrating to them the facial replacement technology he planed to use to map Hammer’s face over that of Pence’s. 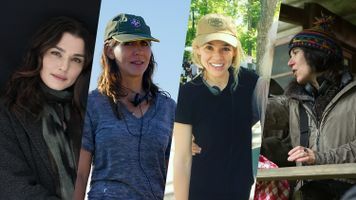 A special featurette shows how this cutting-edge technique worked. While Pence’s body physically stands in for one of the twins in many scenes, Hammer was assigned the task of realistically representing the twin’s elite status, a job he carried off beautifully. “As the Winklevoss brothers, Hammer projects rich-boy entitlement without resorting to preening caricature,” notes Variety. After the runaway success of the 1962 macabre drama Whatever Happened to Baby Jane? Bette Davis found herself once again in high demand, but mostly for similarly creepy Grand Guignol roles. To capitalize on Davis’s popularity, Warner Brothers rushed forward Dead Ringer, which allowed the famed star to do double duty as identical twins. The story––which had previously been adapted into a Mexican potboiler with Dolores del Rio––casts Davis as both a wealthy widow, Margaret DeLorca, and her evil twin sister Edith. After Edith murders her rich sister and assumes her identity in order to take over her estate, she is arrested (as Margaret) for killing herself. 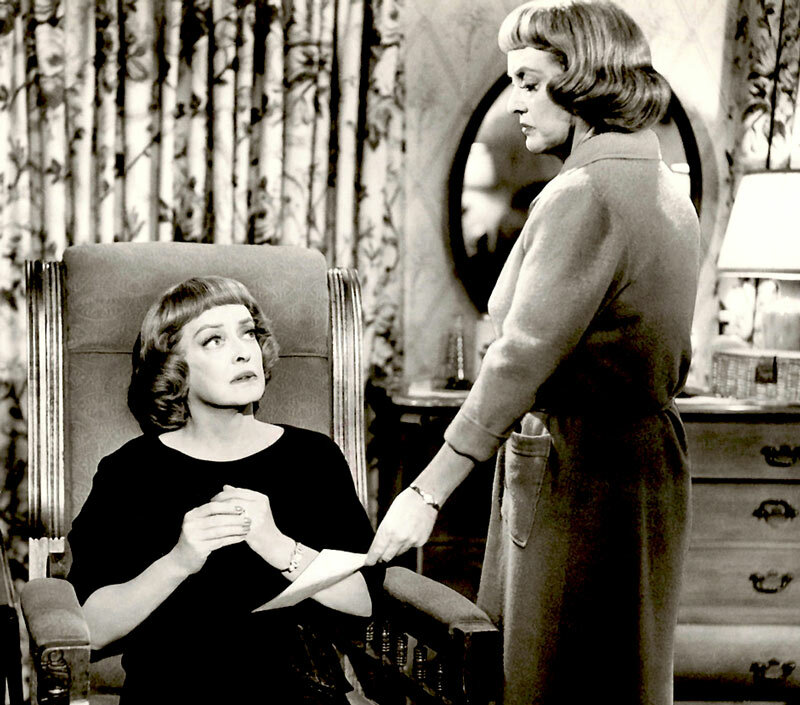 Davis had previously played identical twins in the 1946 A Stolen Life, a romance for which cinematographer Ernst Haller developed the original process technique for creating the illusion of twins. Director Paul Henreid hired him for Dead Ringer to improve on his technique. While Davis worked hard, going so far as to rewrite most of the script with Henreid, she could never completely distance herself from film’s creaky plot. But critics and fans actually loved Davis’ heroic struggle to overcome the melodramatic material. “Her mammoth creation of a pair of murderous twin sisters not only galvanizes this uncommonly silly little film, but it is great fun to watch,” proclaims The New York Times. 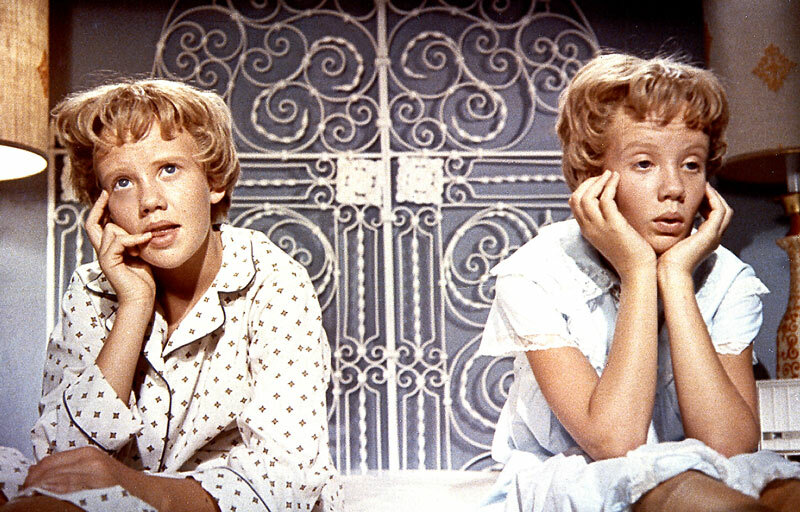 After child actor Hayley Mills won an Academy Juvenile Award for his starring in role in Pollyanna, Disney wanted to get her in a new film as soon as possible. The studio dug up the German children’s novel Lottie and Lisa, about identical twins discovering each other at summer camp. When their mother and father divorced soon after their births, each went off to live with a different parent, knowing nothing of the other. Reunited, the twins steer a course of mayhem and mischief, as they switch identities and plot to reunite their wayward folks. In The Parent Trap, Mills played both girls with Maureen O’Hara and Brian Keith as the parents. Originally the studio wanted to keep the number of process shots, which would show the twins together on screen, as low as possible. But when Walt Disney saw how seamlessly the studio’s new sodium vapor process for compositing worked, he pushed for many more scenes with Mills playing both twins in frame. Walt’s instinct proved spot on, with the film becoming a critical and commercial success. Time Magazine exclaimed, “The film is delightful—mostly because of 15-year-old Hayley Mills.” And editor Philip W. Anderson was not only nominated for an Academy Award, but also won the very first Eddie Award from the American Cinema Editors. In adapting John Pearson’s The Profession of Violence: The Rise and Fall of the Kray Twins into the feature film Legend, writer/director Brian Helgeland worried about how the traditional effect of having one actor playing both characters might prove distracting. “I keep looking at it and not thinking about the movie,” he explained to The New York Times. But Tom Hardy’s skill in creating two unique characters won him over. The brothers, who ruled the London gang scene in the 1960s, were twins but very different personalities. Hardy, who told the Evening Standard this “is the hardest thing that I've tried to do in my career,” played the brothers against each other, with the psychotic Ronnie often creating the mayhem that the more sober Reggie would have to clean up. 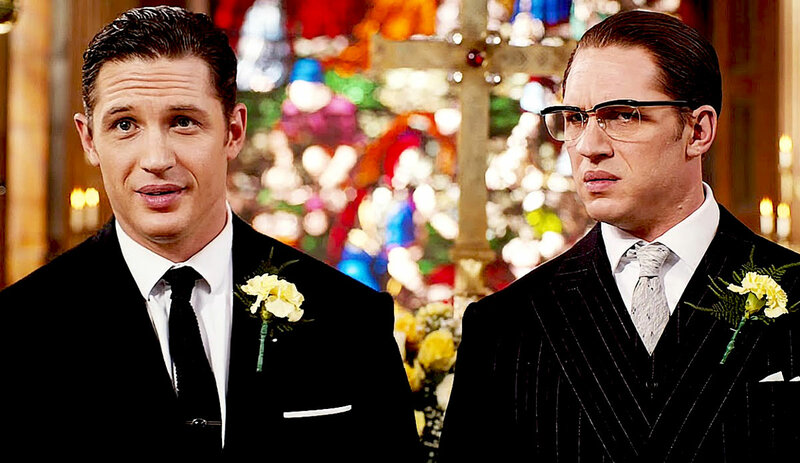 During production, in order to have someone to act against, Hardy’s stunt double Jacob Tomuri would stand in for the other brother, miming Hardy’s twin’s lines (while Hardy listened to himself as his twin in an earpiece). Things got more difficult when Hardy had to fight with his twin. Tomuri exchanged violent blows with Hardy, with the filmmakers mapping Hardy’s face onto Tomuri’s in post-production. Hardy’s hard work ultimately paid off. 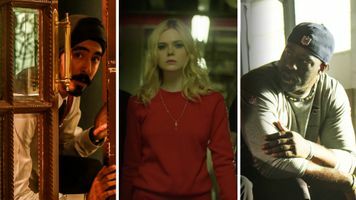 “Much more than a gimmick, it’s like watching one side of a mind wrestle with the other––literally, in one explosive, fun-to-unpick fight scene,” writes Time Out. “Each twin is totally distinct: Ronnie operates on a knife-edge of paranoia and delusion (he was schizophrenic); Reggie is tough, precise and protective of his fragile sibling.” Although he played both brothers, Hardy won only one British Independent Film Award for Best Performance by an Actor in a British Independent Film.